Patrick Rock, who has been convicted of possessing and downloading indecent images of children, may not be a household name, but he has been a powerful figure in the upper strata of the Conservative Party for decades. He and David Cameron have known each other for many years. The pair first worked together as special advisers to Conservative minister Michael Howard in the late 1990s. Indeed, such was the strength of their relationship that Mr Cameron brought him back into Downing Street in 2011, appointing him deputy head of the No 10 policy unit - which is a key driving force behind government decision-making. Tipped for a possible peerage, Mr Rock - 65, from west London - has been described as "a troubleshooter across a range of policy and political issues". He is also credited in Westminster with coining the phrase, "Cows moo, dogs bark, Labour puts up taxes", used by the Tories in the 1970s. But while he may have climbed the ladder as a civil servant, political office has repeatedly eluded him. On three separate occasions he failed to make it as an MP - defeated while contesting Woolwich East in 1979 and Crewe and Nantwich in 1983. He also lost a 1984 by-election in Portsmouth South, then regarded as a safe Tory seat. In January 2013, Mr Rock inadvertently found himself in the spotlight when he was photographed in Downing Street carrying a document, not meant for public consumption, which weighed up the pros and cons of releasing an annex to the government's Mid-Term Review. It warned that the full version of the review, containing the audit, would identify "problematic areas" and lead to "unfavourable copy" identifying "broken pledges". Instead, it suggested the annex could be "published without fanfare" on the government's website several days after the release of the main review. The document was branded an "audit of coalition broken promises" by Labour leader Ed Miliband. In his role at the policy unit, Mr Rock was one of several officials working on strategies to try to rid the internet of child abuse. Last November, leading search engines Google and Microsoft agreed to introduce changes that would prevent abusive images from being listed in results for more than 100,000 searches. Mr Rock was arrested in the early hours of 13 February 2014 on suspicion of an offence relating to child abuse imagery. He had resigned from his post the previous evening after Downing Street was made aware of a potential offence. David Cameron told a press conference he was "profoundly shocked" when he learned of the allegation against Mr Rock. He said it would not have been right to "pre-emptively brief out a criminal investigation, but as soon as questions were asked... we have given very full and straightforward answers". 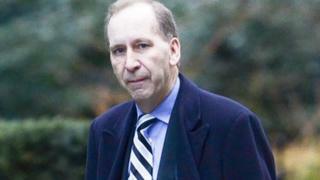 Lance Price, a former adviser to Tony Blair, told the BBC: "Patrick Rock is a very close adviser of David Cameron's. They've known each other for many, many years. "They were special advisers together way back when Margaret Thatcher and John Major were prime minister, and he was deputy head of the policy unit at No 10, so this is a very senior individual."